This member of the rose family is also known as cocklebur and liverwort, and as an expression of gratitude in the language of flowers. The aerial parts of the plant are used to make teas, infusions, bath bags, mouthwash and topical preparations. 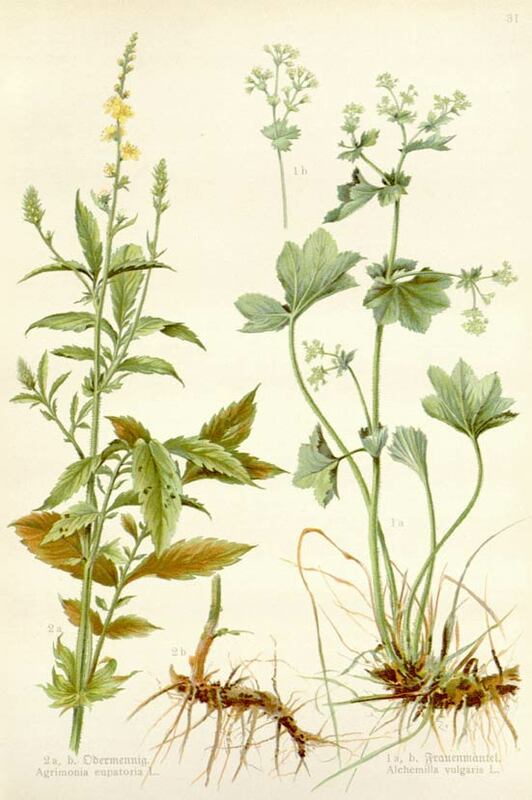 Agrimony is also one of the 38 herbs found in Bach flower formulas. Agrimony is dark green perennial member of the Rosaceae family (Rose family) with numerous soft hairs. The soft hairs aid in the seed pods sticking to any animal or person coming in contact with the plant. The flower spikes have a spicy odor like apricots. It can reach heights of 3-4 feet. Its roots are deep rhizomes, from which spring the stems. It is characterized by its typical serrated edged pinnate leaves. The short-stemmed, yellow flowers appear from June to September, in long, spike-like inflorescences. The single flower has an urn-shaped curved flower cup; the upper edge has several rows of soft, curved hook-shaped bristles. The flower has fivefold radial symmetry (five sepals, five petals, and so on). The flowers with their abundant pollen supply attract hoverflies, flies and honey bees. The pollinated flowers develop fruits with burs. These attach to passing grazing animals such as cattle, sheep and deer and are spread over a large area. The name Agrimony comes from the Greek Argemone, which means a plant that is healing to the eyes, although Agrimony isn't often used in this capacity. Eupetoria is a reference to a king who died in 63 BC and was renowned for his herbal skill and knowledge. Also called Church Steeples for how the flower spikes stand up straight and tall, known as Cockleburr & Sticklewort for the burrs on the fruit that can stick to the fur of passing animals. Agrimony is a perennial native to Europe, Western Asia and Northern Africa that has naturalized to most of the US and Canada. It grows in open areas, fields, wastelands and hedgerows. Agrimony prefers full sun, but the plant is sturdy and can also tolerate partial shade. All types of wetlands and marshes, wet meadows, and general open areas are the kinds of habitats where this native European herb is likely to be found. It is naturally adapted to growth on alkaline soils, it can however, tolerate slightly acidic soil in most cases. The herb will require water during the dry periods or it will fail to flower-this is despite the fact that the plant itself is quite easy to cultivate on dry soils. Agrimony should be sown from seed in winter, or they may be stratified by putting them in the refrigerator for a couple of weeks before spring planting. Sow on open ground, it will self-seed once it has become established in the soil. Agrimony is an invasive perennial so you'll need to be vigilant to make sure it doesn't take over your garden space. Agrimony can be harvested midsummer or when the flowers just come into bloom. Cut the whole plant and hang outside to dry. Or harvest the leaves as needed. The leaves, flowers, and stems can be used fresh in herbal remedies or then may be dried and stored for use at a later time. To dry, find a shaded location out of direct sunlight to dry agrimony. Carefully spread out the leaves, flowers, and stems on a wire rack – the location should be kept dry and warm at all times. Airtight jars can be used to store the powdered and crumbled down plant material — these can then be placed in storage and the powder can be used as and when needed. You may not have heard much about agrimony because it's not used as much as it once was. However, you may find that there are some very modern uses for this old-fashioned herb. Agrimony has a very interesting history. It’s been used by witches to help get rid of negative energies. It was also used by Anglo-Saxon people to create charms. It was also thought to help bring a deep sleep. And while these uses may not be very popular today, they certainly give agrimony an interesting character. Agrimony can be used for a broad spectrum of health issues. It can help to boost your immunity and help you fight through flu and cold season with fewer sick days. If you're suffering from diarrhea, agrimony can help to relieve your problem. Take caution if you’re constipated — agrimony will only serve to make the problem worse. You can also use agrimony as an astringent. It's great for use as a mouthwash and if you have a sore throat or sores in your mouth, you can use it as a gargle. The astringent qualities will help to clean the wounds and fight bacteria and viruses that may be at the root of the pain. In Chinese medicine, agrimony is used as well. In fact, it’s considered a powerful ingredient for stopping bleeding. In Chinese medicine it has a different name, Xian He Cao. You may find it under that name. 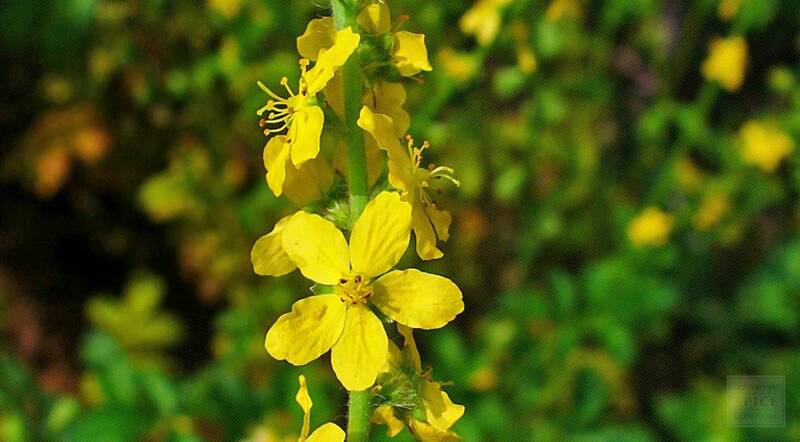 Agrimony can also be an ingredient in lotions that help to treat sores and skin irritations. The oil in the plant can actually help to fight bacteria that can cause wounds to become infected. Using agrimony will help speed up healing time and allow you to have relief from pain. If you're blemish-prone you can use a strong concentration of agrimony decoction. Apply it directly to your irritated skin and you'll experience its ability to fight the bacteria that’s causing the problem. You'll have clearer skin with a natural remedy that doesn’t have any negative side effects for your skin. While you may not have heard much about this powerful herb, you can see it has major health benefits that you may enjoy. One of the best ways to add agrimony to your regimen is to make a tea with it. You can also find lotions that have agrimony in them. In addition a strong decoction can be used to apply to your skin.